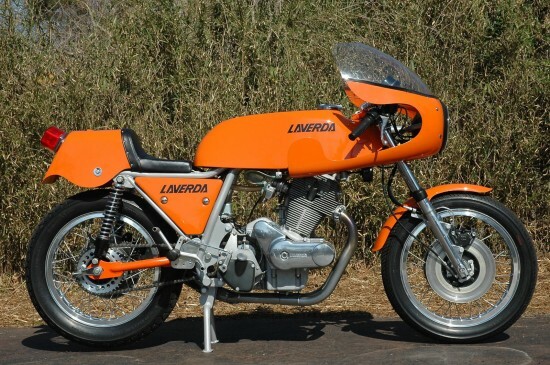 I’d love to see a modern sporting machine that embodies the classic Laverda virtues: stability, durability, and speed. And orange. Yeah, as far as I’m concerned “orange” is a virtue. The SFC was a racing special developed from the standard SF1, a 650 and later 750cc parallel-twin machine introduced in the late 60’s to compete in the US against bigger American and British bikes. 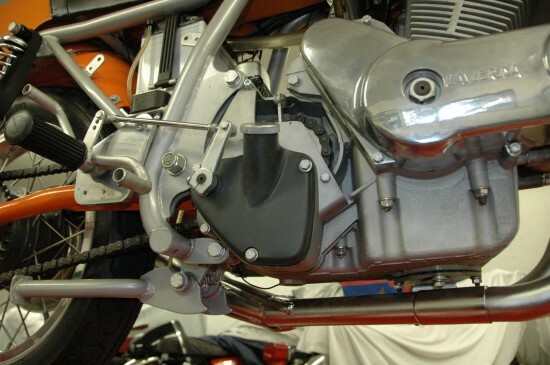 Laverdas had a reputation for being durable and overbuilt and performed well in endurance race events. What componenets they didn’t manufacture in-house, they sourced from the very best names in the business, and the results have a distinctly international flavor: Ceriani suspension from Italy, Bosch ignition components from Germany, and a Nippon-Denso starter from the Land of the Rising Sun. The SFC was a true homologation special, filled with serious race parts and then tuned to make them sing: they produced between 71-80hp, depending on the year and only 549 were ever produced. They came with road-legal equipment, but the bike was really best suited for the track. 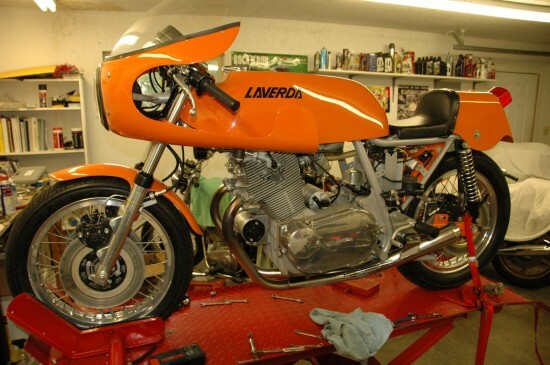 This is a genuine Laverda 750 SFC. It was on the 750 SFC Registry maintained by Marnix Van der Schalk when I bought it seven years ago from a noted private collector. It is one of the 100 or so made for the US market featuring full instrumentation and Jota style bars. It is a street legal race bike. The previous owner bought it in its restored condition and did not know for sure who restored it, but he thought Lance Weil worked on it. Whoever did it spared no expense or effort in this meticulous and correct restoration. I regret to say that I have ridden this gem less than 10 miles- I consider myself a curator of this bike. I have other Laverdas that I actually ride. After riding it last I changed the oil, drained the tank and carbs, and fogged the engine with marine fogging oil. I leave it in gear and every week or so I turn the engine over manually with the rear wheel. When I did start and ride it I found that it lit up quickly with an alarming snarl from the two-into-one race pipe ( I will include the street exhaust system). It revs very quickly when goosed, making a sound that sends shivers down the spine. The clutch works properly, as do all of the gears. 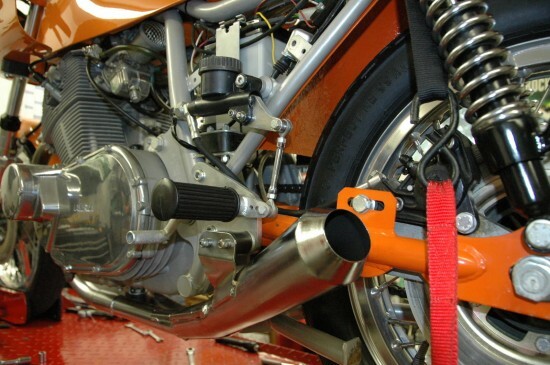 I am a Laverda fan, having owned nine of them, and I can vouch for the fact that the SFC is something special. Please study the pictures. You will see the new wiring and electrical parts, the magnesium hubs and gear selector cover, the new rotors, switches. You will also note the damaged paint on the rough fiberglass inner side of the fairing. That was from a leaking master cylinder. There is no battery in it now. 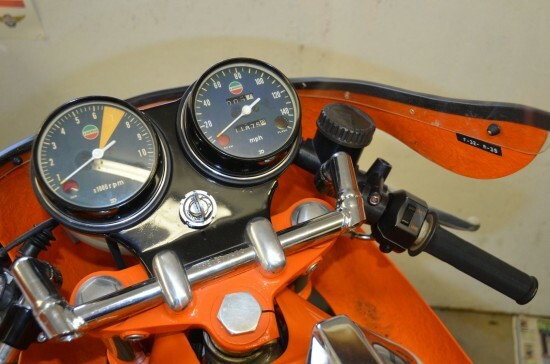 The owner sounds very knowledgeable and is clearly a Laverda enthusiast: for those of you who don’t know, Lance Weil was considered to be the Laverda tuner in the US, and any bike he worked on is generally considered to have been touched by the hand of god. I only wish he’d included a video clip of the bike starting and running so we could all share the sound of that exhaust. With less than 600 made over their entire six-year run, this is a very rare, collectible machine and the $50,000 asking price reflects that. He’s already had one offer so that price, while shocking at first glance, is clearly reasonable for someone. eBay says it is no longer available – $50k price and there were 3 undisclosed offers made. Difficult to tell if it was sold or not sold. Oh well. I like reading about this SFC. However the $50K price is waaaay out of my price range. Best of luck to the buyer. Awesome. I had a non-running SF2 that came with all of the orange SFC body work back in the day. I was like 19 and could never pull of the conversion and ended up selling it. The guy who bought it put it together nicely. He let me take it around the block and I was blown away at how quick it was. And I was used to riding a LeMans 1 and a bevel 900ss. These things are amazing. Somebody got something special for their $50k. I rode an SFC for Tom Lester’s Racing Team (Lester Wheels) back in the early-mid ’70’s. Did a few sprint races and ran the 24 Hours of Nelson at Nelson Ledges for him. I’d never experienced an Italian twin before, and it was an eye opening experience! What a gas!! Makes for a fond memory today. With 750SS’ bringing $150K plus, $50K, while a lot, doesn’t seem so unreasonable. Very cool! And I agree, it’s not really all that much money, considering what you’re buying. You obviously have impeccable taste. I really need to make a “must ride” list and get to work tracking down the machines on it to get rides on them before I get too old. …be very very careful when buying a 750 SFC. There are tooo many fakes on the market….